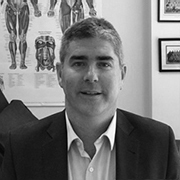 Dr. Corey Cunningham is a fellow of the Australasian College of Sport and Exercise Physicians (ACSEP), having completed specialty training in Sport and Exercise Medicine. He is also a Fellow of the Royal Australian College of General Practitioners and has completed a postgraduate Masters in Sports Medicine at the University of NSW. Dr. Cunningham’s experience includes working with elite teams across a range of sports, including rugby, soccer, rugby league, paralympic sport, netball, sailing and golf. He has presented at professional conferences as well as to community groups and sports medicine personnel. He is currently the Medical Director for the NSW Institute of Sport, Chief Medical Officer for Football NSW, Australian Paralympic Team and the Australian Sailing Team and works with Australian Rugby, Gold Coast Titans, Western Sydney Academy of Sport and Barker College. He has developed multiple RACGP QA & CPD Activity Learning Modules for GP education is on the Board of Censors for ACSEP and is a convener of the annual ACSEP Scientific Conference.